For many, this white chicken chili recipe is the quintessential Randall Beans recipe. Honestly, we get asked all the time where and who this recipe came from and year after year continues to be one of our most talked about recipes. Maybe it’s your favorite supper from cold winter nights with Grandma or tailgating in the fall – it doesn’t matter where you had it, all that matters is how delicious it is. Everyone loves chili, but sometimes it feels good to switch things up from the red meat-carried and tomato-based classic chili. 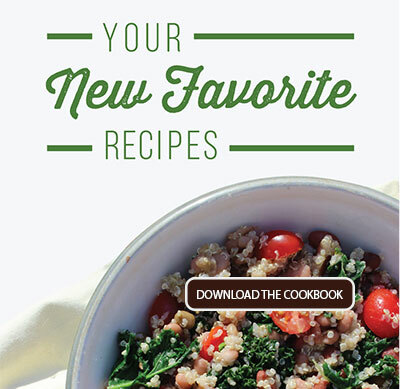 Looking to cut back on some of your red meat, without cutting back on flavor? White chicken chili is just the winter-time treat you are looking for! 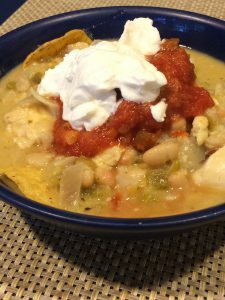 And, if you’ve never had white chicken chili before, there is no better introduction than this recipe right here. To prepare white chicken chili it is all about substitutions. Start by replacing ground beef with lean white chicken breasts. 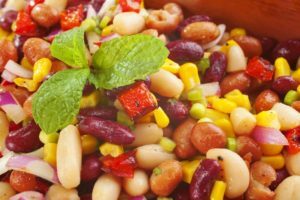 Use light great northern white beans as a stand in for the kidney beans. Instead of being simmered in a tomato-based broth, it’s all about chicken broth and light, fresh flavors like oregano, jalapenos and garlic. If you like a spicier chili, leave the ribs and seeds in the jalapeno; leave them out for a milder flavor. 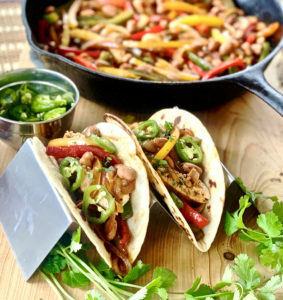 You can also substitute mild green chilis if you don’t enjoy the bite of the jalapeno. These milder peppers give a subtle tang without the burn. Of course, this chili is delicious on its own, but why not create a toppings bar for your family? Set out bowls of salsa, diced tomatoes, shredded cheese, sour cream, diced avocado, raw onions, cilantro – the sky’s the limit, and everyone gets to top their bowl exactly the way they like it. In our house, we often battle between Frito’s corn chips and more traditional tortilla chips. The truth? It is absolutely delicious either way. So whether you want a comforting meal on a cold night or a delicious weeknight meal, you won’t regret trying this white chicken chili. Wash and trim the chicken breasts. Cut, crosswise into small strips. Heat 3 tablespoons of the olive oil in a heavy pot. Sauté the chicken, stirring over high heat just until cooked through, about 5 minutes. Remove with a slotted spoon to a side dish. Add the remaining oil to the pot and sauté the onions, garlic, cumin, and cayenne, stirring for 5 minutes. Stir in the oregano, salt, jalapeno peppers, chicken broth, and Randall Beans. Bring to a boil and cook for 15 minutes. Stir in the cheese, stirring until melted. Return chicken to the pot and cook for 5 minutes. Feeling a little daring? 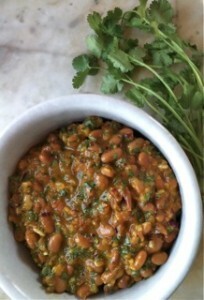 Then check out some of our other white bean chili recipes too.